Valerie: Hi Lauren! Welcome to Inspy Romance. Our eager romance fans would love to get to know you a bit. Let’s start with some Quick Fives, okay? Lauren (leans forward): Yes! Let’s do it. Lauren: Hamburgers, French fries, fried chicken, pizza, and ice cream. Valerie: Um… wow. How did you get into one of my novels? I’m all about healthy, real food. Lauren (shrugs): Not sure? I think you picked me. I definitely didn’t pick you! Valerie: Okay then. Five reasons you chose veterinary medicine? Lauren: One, my dad was a vet. Two, I love animals. Three, I like variety in my work. Four, I get to know everyone in the county. Five, I was brainy enough to get in??? Valerie: All valid. Five reasons you like living in Saddle Springs, Montana? Lauren: Where else would I live? Valerie (taps fingers): Five reasons? Lauren (sighs): One, it’s my hometown. Two, quite a few of my friends stayed or came back. Three, I love the mountains. Four, I inherited a place to live and a business opportunity. Five, I love teaching Sunday school at Springs of Living Water Church. Valerie: Great! Let’s move on to other questions. Are you interested in romance? Lauren: Very interested… for other people. I like to see my friends happy, so I keep trying to match them up. Lauren: Not yet, but I’m working on it. Valerie: Are you interested in romance for yourself? Because I noticed the way you worded that. Lauren: Yes, but mostly no. I mean, it’s complicated. There are good reasons why some people I know ought to get married, the sooner the better. Lauren: What? No! That’s not what I meant. Other kinds of reasons. Valerie (leans closer): Do you want to talk about it? Lauren (crosses arms over her chest): Nope. And you can’t make me. Lauren (interrupting): Don’t remind me. Valerie: I know that seems like a huge milestone for some people. Like they’re suddenly old. I hate to tell you, but some of us are pushing double that and don’t feel ancient yet. Lauren: That’s not why thirty matters. Valerie: So, why does it? Lauren (glares): I see you already told everyone in the description of this book you’re writing about me. Which, I want them all to know, you didn’t have my permission for. Valerie: I’d say I was sorry, but I’d be lying. I like you, Lauren, and I want to see you come to grips with some issues from your past and gain happiness. Lauren: I was perfectly happy before you interfered. Valerie: Were you now? What about binge-eating ice cream and crying in your pillow? What about trying to pretend you wanted to see a certain someone married to someone else? What about the thoughts of selling out and moving away? Lauren (narrows gaze): I was happy. Valerie: How about if I mentioned that the certain someone — let’s call him “James” — wasn’t as happy as you were pretending to be? Lauren: Look, do your worst, okay? I stand by my decision to see him married off to some other woman. I have my reasons, and you can’t make me tell them. Valerie: I know all about that, and I’ll reveal the information as I see fit. Friends don’t let friends turn thirty… single. It’s been fourteen long years since two teens made a pact to marry each other if both remained single at thirty. But the nearer the time comes, the more Lauren Yanovich steps up her matchmaking game to let James off the hook. Not that he likely remembers. James Carmichael has been waiting forever, praying Lauren will be waiting for him. But, just when the end is in sight, she begins dating someone else, and his hopes crumble. 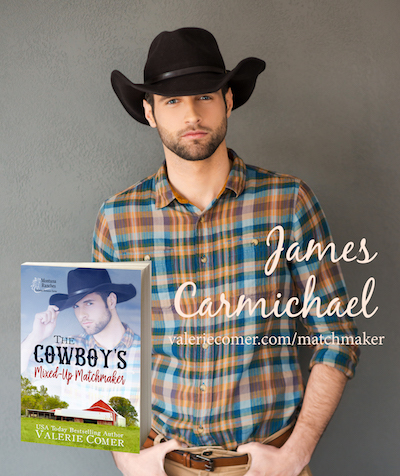 What’s a cowboy to do when the love of his life insists they’re all wrong for each other? 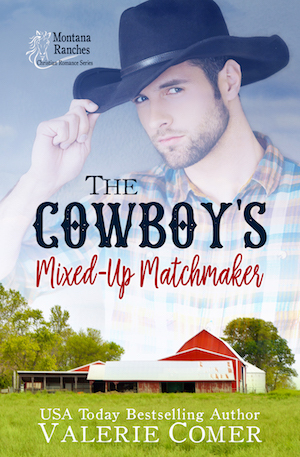 The Cowboy’s Mixed-Up Matchmaker releases on December 1 . It is currently up for pre-order and will release on Amazon only (and in Kindle Unlimited)! Comment below and let’s talk about matchmaking! Have you ever tried to set two people up? How did that work out for you? Or… did someone try to set YOU up? One commenter’s name will be randomly drawn on Saturday to win an advanced reader copy. Hi Valerie, this was fun:) I love the banter! Lauren and James sound great, I cannot wait to read their story- even if Lauren is reluctant!! I tried matchmaking when I was much younger….and then found out that one of my matchmaking tricks actually did work in the end and they got married! I so enjoy your character interviews! Every single time. To answer your questions, no and no. I wish someone had, though, seeing as I haven’t figured it out for myself yet. I’ve had a couple of women ask me to write them a romance! Too bad it’s all fiction. That was so much fun, Valerie, thank you for sharing!! I admit turning 30 was horrible for me!! I have never been a matchmaker or a victim, er, recipient of matchmaking….lol, sorry! I don’t think you need to be sorry! Although Lauren will be. That was great Valerie! No matchmaking for me although I used to tease my two girls when they were looking for Mr. Right that they should just let me, I could find him ;) They both did just fine without my help, imagine that! Love it, Tracey! My kids did fine without my interference… er, help, too. My friends are always trying to set me up. A couple of friends tell me I am too picky. I tell them I would rather stay home and read than date sometimes. Getting the guys to have a conversation is so hard. One time I googled 200 questions to asked just in case. Nope never set anyone up and love the interview. Hi Valerie! Delightful interview. As a college student, two different guys wanted me to play matchmaker and introduce to them my girlfriends. Both couples were married. My husband and I were friends with both couples. Even though I was frank with my one girlfriend before she married, their marriage ended in divorce. My other girlfriend passed away of cancer in her forties. Her husband recently remarried. While in college my home church hired a single pastor. Church people tried to play matchmaker, which angered my father when I no longer wanted to attend church. Fortunately I was leaving to go away to college. To the congregations surprise, I ended up meeting my husband and being married to a minister and we became good friends to the pastor and his wife. Because of being forced into role of matchmaker and have matchmaking thrust upon me, I have stayed away from being matchmaker. Best wishes on your new book. I’m sorry to hear the negative real-life stories, but I’m glad you found your hubby. In all the pix I’ve seen, you two look genuinely happy together. Hmm. Almost 30 years ago, I was happily married and my sister was single. There was a co-worker that I thought about matching up with my sister. I talked to her about it but had not mentioned it to him yet. Then my (now ex-)husband decided he wanted a divorce and all matchmaking went out of my head while I dealt with that. When my co-worker heard about my divorce, he started showing signs of interest in me. I decided it might not be a good idea to matchmake after all. My coworker and I are now retired and have been married for 28 years. When I was very young I did and it went horribly wrong! I did. My son and they didn’t connect. Oh well. You can sympathize with Lauren, then. Her attempts were also unsuccessful! Preordered it. Thanks for writing such great stories. Glad to hear another success story, Susan! I hope you enjoy this novel. I love the creative way you introduced us to Lauren! I have never played the matchmaker. But there was a family who played matchmaker with my husband & I. My husband was friends with the husband of a woman whose Bible study I attended. I didn’t have a car, and they lived out of town. So they invited me to their home several times, and then invited my husband (who was only a friend in our college Christian group) to drive me and come with me. That was 42 years ago, and they still openly claim to all who will hear that they played matchmaker with us! We were introduced as such in front of a party for their 60th wedding anniversary. Oh, I love that! Thanks for sharing your story, Becky! My friend played matchmaker with my X-husband and I. It was good until life complicated things. Now we are friends and have been dating for about as long as we were married. That was a fantastic interview. I loved all the great questions and great answers. Great job. Glad you enjoyed it, Lori! It’s been a few years since I was thirty, too. LOL. This interview is why I LOVE your books! Can’t wait to read it. Thank you for all your inspiring novels! ” I’d say I was sorry, but I’d be lying. ” LOLOLOLOL. #sorrynotsorry Thanks for giving me a laugh this morning! I’d love to have a copy. I thought I wanted to be a vet once. Until I realized all the patients don’t live and I didn’t think I could handle that. So I wrote a vet. It’s fun to live virtually through our characters where all the pets live. Did you ever dream of being a vet, Valerie? No, I never wanted to be a veterinarian or anything in the medical field. I’m too squeamish with blood and guts and stuff. I’ll take the sanitized version I can write about in my novels! 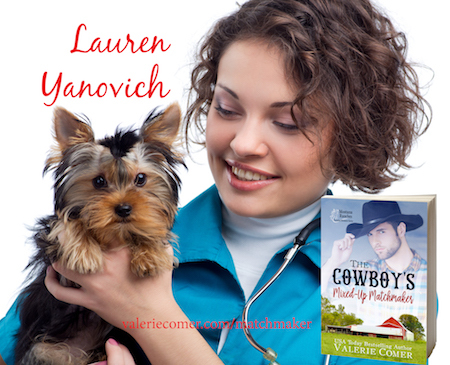 This is my second veterinarian – my first was Zach Nemesek in Raspberries and Vinegar. 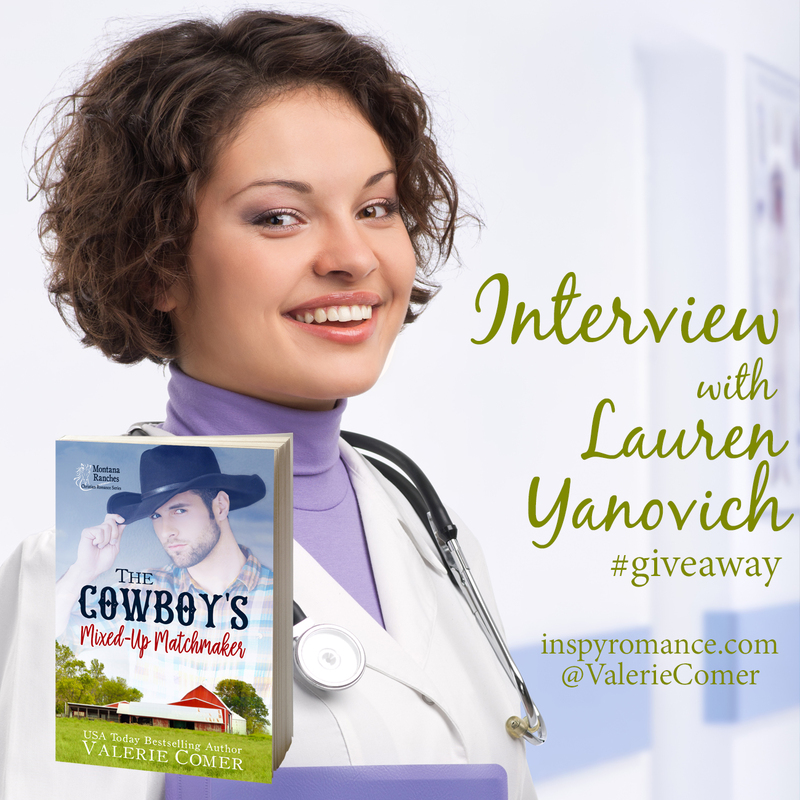 Great interview Valerie! The cover is beautiful!